Natural Habitats Fisheries Biologists conducted a walleye study for a 160-acre sandpit in 1997-1999. Here, one of our biologists removes a walleye from a gill net. 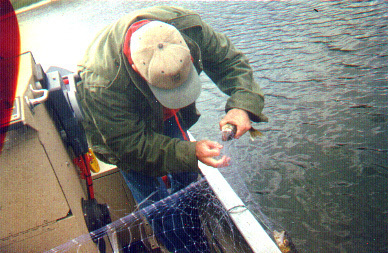 Hundreds of walleye were sampled via electrofishing and netting to collect data on the lake's walleye population, which was declining since 1995. Our staff identified a lack of prey as a limiting factor in the fishery. A prey base was successfully reestablished by our firm, and relative weights and other condition factors have improved significantly in the waterbody's walleye.